Back saw: Smaller and more rectangular than the cross-cut, the Back Saw has a reinforcement along the back edge. It is intended for use with a simple miter box, for cutting accurate 90 and 45 degree angles. Jig saw: The Jig saw is a hand held reciprocating saw with a flat surface to ride across the wood. 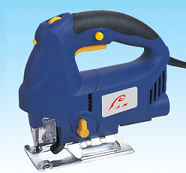 With a shape similar to a staple gun and a thin blade, it is capable of tightly curved cuts. They tend to be the least expensive power saw, and easy to handle, making them popular as a first power saw. However, the vibration from the reciprocating motion can make them tiring to use. Reciprocating saw: Better known by the brand name “Sawzall”, these are used more for demolition than construction. Uses larger blades than the Jig saw, and shaped more like a shotgun. 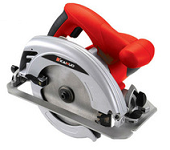 Circular saw: As the name implies, these use a circular blade, with the most common size 7.25″ in diameter. Only cuts strait lines, but much more powerful and efficient than the jig saw. Also, potentially more dangerous. If you don’t have a table saw, this is the next best choice for cutting large pieces of plywood. Power Miter saw: This is basically a circular saw attached to a swing arm and a work surface. Used for cutting precise angles. Most have 2 dimensional angle adjustments, which is referred to as a Compound Miter saw. More expensive models include a sliding feature that allows cutting wider boards. Typical blade size is 10″, which allows cutting boards 6″ wide without a slider. Band saw: A Band saw uses a thin metal loop, or band, for the blade. The thin blade allows curved cuts, but the need for the opposite side of the “loop” means that the distance between the edge of the wood and the cut is limited. Used mainly for trim work with intricate scrolling shapes. Also used by butchers. Table saw: The table saw is the ultimate woodworking saw for larger projects. The circular saw is positioned in the middle of a work table, with the blade facing up. It only makes strait cuts, but can by used to make a variety of complex joinery cuts using various jigs. It’s also expensive, and takes up a lot of space. Of course there are many other saws for purposes other than woodworking, but these are the ones the readers of this site will be using the most. As a starting point, any tinkerer should have a hand saw and a simple miter box. The miter box is just 3 sides of a box, connected as front, bottom, and back. The front and back have slots that you can slide your saw into, allowing for precise angle cuts by hand. The Back saw is ideal for the miter box, but the cross-cut saw will also work. With a hand saw and Jig saw, most of the cuts needed for do it yourself projects are covered. However, one more power saw can make a huge difference in efficiency. While the circular saw is very versatile in that you can cut large sheets of plywood, the Compound Miter saw will often be the most used saw when building furniture. They do not fit in a drawer like a Jig saw, so they generally require at least a little dedicated workshop space. But the speed and accuracy can make for projects that are more enjoyable, and produce better results.